Purple Stone & Silver Dangle Earrings. Genuine Amethyst, 925 Sterling Silver. 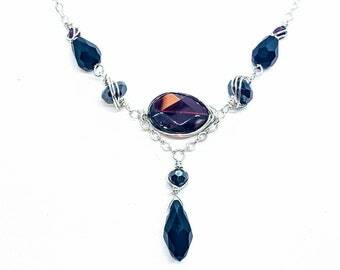 Natural gemstone, semi-precious beaded, wire wrapped. Announcement Welcome to Kione's Prism Jewelry. Designing and creating jewelry has been my big passion for over 50 years, since I was a four-year-old little girl. More so than loving to create jewelry, is the happiness I feel when others love and wear my creations. I hope that you enjoy seeing my jewels. I am happy to do customs in other stones and metals than the ones pictured. If you see something you like and you would like to have it modified, please feel free to reach out and contact me about your vision. Since this is a brand-new Etsy store, to see more of my jewels, please also visit Kione's Prism Jewlery at the attached links. 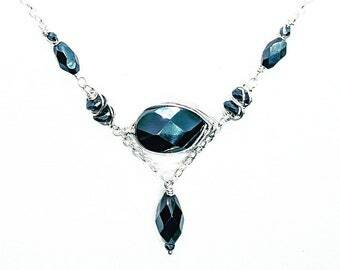 Welcome to Kione's Prism Jewelry. Designing and creating jewelry has been my big passion for over 50 years, since I was a four-year-old little girl. More so than loving to create jewelry, is the happiness I feel when others love and wear my creations. I hope that you enjoy seeing my jewels. I am happy to do customs in other stones and metals than the ones pictured. If you see something you like and you would like to have it modified, please feel free to reach out and contact me about your vision. Grey Stone & Silver Y Necklace, Genuine Hematite, Magnetite Pendant, Sterling. 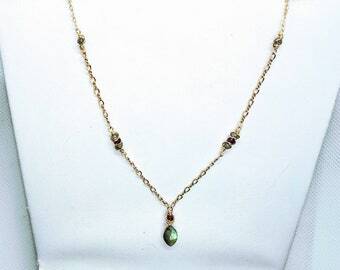 Natural, Semi-precious gemstone beaded, wire wrapped, chain. NOW until May 15th. Everything 10% OFF. Mother's Day is Sunday May 12th. Sorry not available on custom orders. My jewelry workstation can be a beautiful source of inspiration. It's fun to see what gemstones looks best together. Talk about inspiration. Look at these beautiful gems that I get to create from! What a fantastic gift from nature! JEWELRY 💗 LOVE! It's my passion and I've been designing & creating jewels for over 50 years. I hope you enjoy the fruits of my jewlery passion! I have a deep love and passion for jewelry. Making jewelry for myself is often an initial incentive. 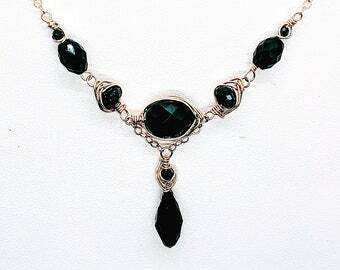 I have created a vast array of styles and a huge amount of pieces of Jewelry over 50+ years. The inspiration for my jewelry has been from many different locations and eras, beginning with Native American beaded jewelry and then progressing to Medieval, Victorian and Art Deco Styles. I have inspiration from all these as well as many other periods. It feels like an endless flow of inspiration that comes through me regarding creations. I wish that I had infinite time to design and create jewelry. Please come check out more of my line on social media and my website. • WEBSITE - http://www.prismjewelry.com . 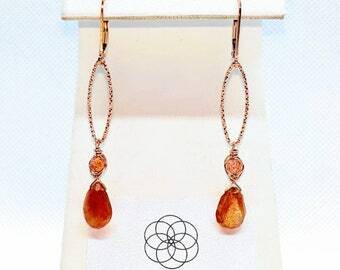 Fascination with nature's beauty and love of art led to Kim-Ione creating her first jewelry at the age of four. Shortly thereafter she was utilizing indigenous people's techniques of hand and loom work. Family, friends and neighbors starting purchasing her jewelry when she was about 10. An extended college education began with a major in fine art (jewelry and painting), continued into marketing and management and finally concluded with a degree in nutrition and food science. These skills were helpful when Kim-Ione opened Prism Art Gallery & Performance Center in Evanston, Illinois (just north of Chicago), in 1986. For 5 years the art center was a community hub that focused on art and social issues. Prism was a bustling place with monthly rotating, themed, multi-artist exhibits. Many nights were filled with theatrical and/or musical performances and socially oriented gatherings. Over one thousand visual and performing artists were represented, including Kim-Ione's jewelry and paintings. After closing the Prism Gallery, Kim-Ione traveled the world for many years and gained inspiration from places of natural and created beauty. Her jewelry style evolved over the following decade residing on the beautiful island of Kaua'i, Hawaii. Kim-Ione's passion for being in the ocean was fully embraced and the resulting style change led to a more organic and flowing, yet geometric & helix like creations. She spent two years in Southeast Asia, primarily Bali and Thailand. While there, she created a clothing and accessory line and continued designing & creating jewelry. There she adopted the nickname Kione. After traveling and living in many places, Kione returned to be with her beloved fiance in the San Francisco Bay Area and lives part-time there and part time in her mermaid land on Kaua'i, Hawaii. 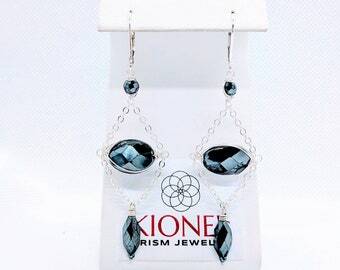 She is very excited to be currently and continually expanding Kione's Prism Jewelry line and is now focusing on a more refined and delicate alternative style. I'd enjoy doing custom orders. It's usually easiest to start out with a design that I offer and make modifications in the stone selection and or the metals. I have a huge assortment of semi-precious stones, freshwater pearls and also use for different kind of metals. 92.5 sterling silver in both a shiny and an oxidized finish and 14 karat gold filled can yellow or rose color. I only work with higher quality gold on order. Please feel free to contact me regarding personalizing your jewelry selection. Thank you. I'm more than happy to share more details regarding incising with you. Most items that I create can be made to a different size preference. Necklaces and earrings can be longer or shorter than the ones I have listed here. I frequently make necklaces adjustable, meaning that there are different places to hook into with the clasp. 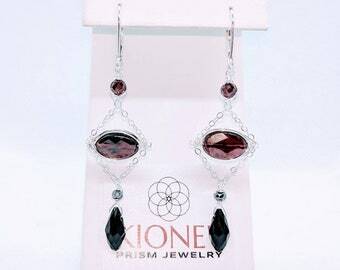 Kione's Prism Jewlery does not require much care. Sometimes Sterling can tarnish and it's best to use a soft toothbrush with some silver cleaner. Please specify If an item is a gift and I will be more than happy to use a nice gift box.